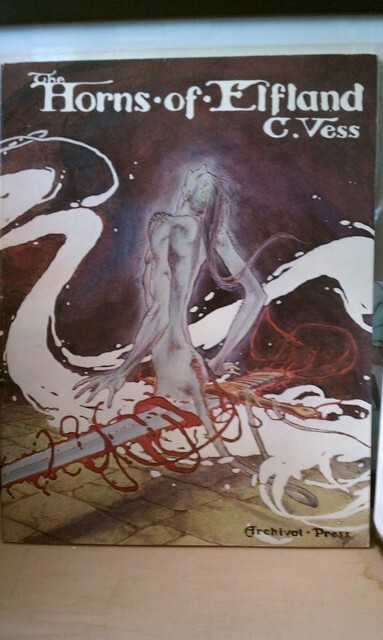 A rather terrific find this week at St. Vincent de Paul: The Horns of Elfland by Charles Vess, published by Archival Press in 1979. 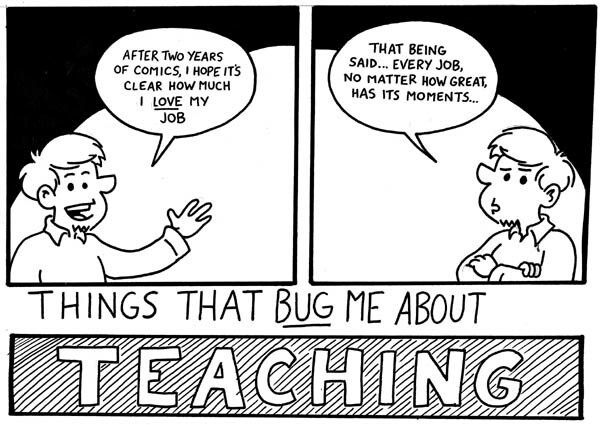 My last day of doing these “Things that bug me about teaching” comics. 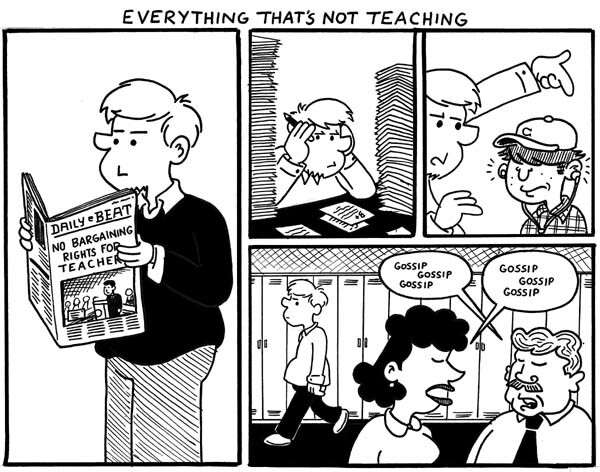 I have wanted to say something about teacher gossip in the comic for awhile, but I took that option off the table fairly early in the strip when I decided not to write any other teachers or faculty into the comic strip. I am fairly certain idle speculation and rumor spreading is a factor in ANY office situation. People like to complain, people like to speculate, often negatively about their job and whatnot. It’s just something I really loathe, although I’m aware that simply by acknowledging the gossip in this comic, I’m feeding right back into what I find annoying. This is more common than I would care to admit. Somewhere along the way, more than a handful of students have a learned sense of helplessness that gets trotted out whenever they’re challenged. It’s something that really hurts me as a teacher, because I work hard to make my lessons engaging and accessible… even when I’m working with challenging concepts. I hate to think of anyone’s default position having so little curiosity. Then again, I suppose that’s the job now though. Getting kids to engage and making school relevant. This is what I’m doing for this week. This happens way more often than I care to admit. Let me stress: there are students for whom you legitimately have to give instructions multiple times. Some students have special needs, or might be on an IEP. In those cases, it’s not a problem to direct, redirect, and occasionally direct a third time. There are, however, students who just like to procrastinate within the confines of the class. 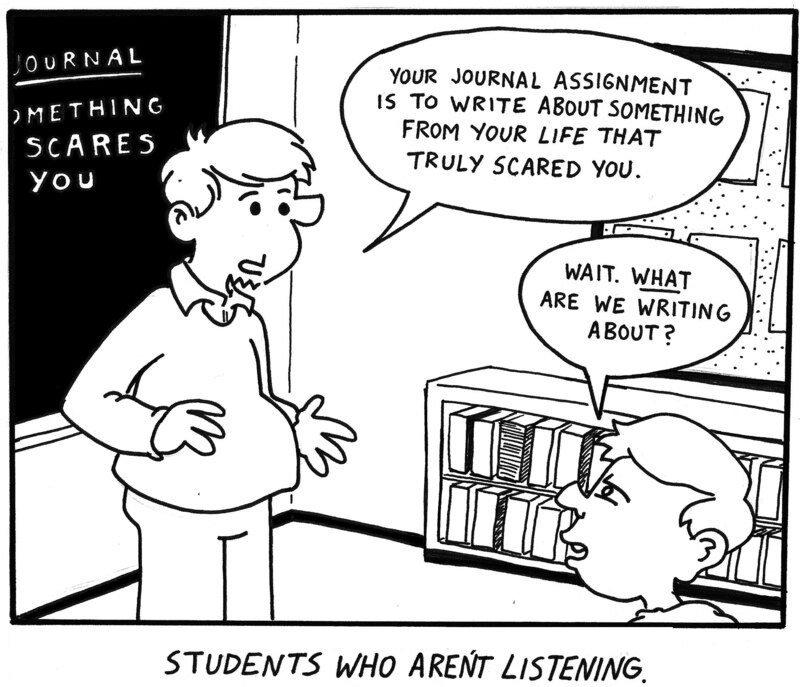 There are students who don’t listen simply because they don’t care to engage. The simple solution to this problem as a teacher is simply to NOT to repeat yourself… and make that a policy. Unfortunately, this is something that I as an educator, am HORRIBLE at doing. I’ll set the policy, I’ll live by it for like a week, and then before you know it, I’m repeating myself over and over and over again. That’s a big blind spot in my own teaching style and something I truly need to work on. Oh hi. Here’s what’s going on. To be clear… I have NO problem with students doing make-up work. 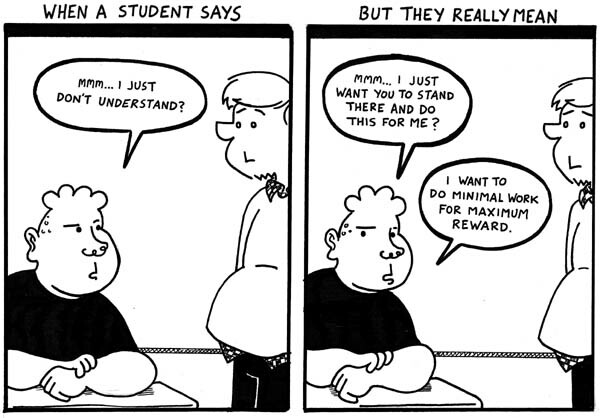 I greatly encourage kids to come in and get their missed assignments in a timely fashion whenever they are absent. Most students do this with no problem. 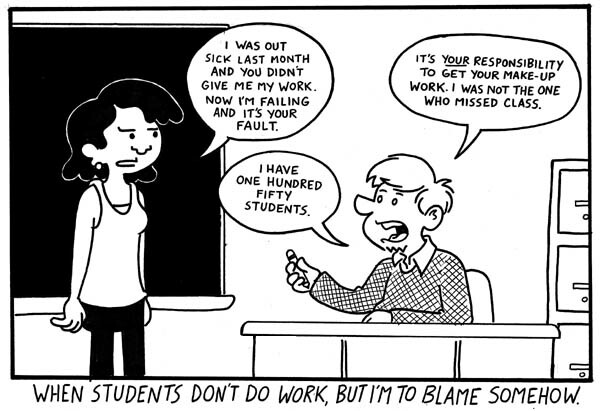 My problem becomes when a student puts off making up their work past the point of sensibility, and then shifts to the “blame game” when they sense the hammer about to fall on their grade. Click here if you’re new. I thought for the next week, I’d back slowly toward an aspect of my job that I don’t often address. Confucius once said “Choose a job you love and you’ll never have to work a day in your life” and while I mostly agree with the guy… I do think, by design, work isn’t always fun. Work isn’t always every person’s favorite. I try to stay away from those sentiments because, quite truthfully, I do love my job. I can’t imagine doing anything else for a living and I hope over the last few years, I’ve shown that both in my comics and in my random blatherings on this blog. As any educator will be able to tell you, there are challenges and annoyances to the work. I thought I’d take a week to capture some of my pet peeves. I realize this is a risk, considering someone could “drop in” on the comic this week and think that I’m as caustic and careless as Natalie Munroe. For that reason, I’m going to direct link to today’s comic every day AND provide an additional link to my “About the Artist” page wherein I discuss the balance I work to strike between maintaining a public blog and keeping my students’ anonymity. If you’re someone who reads regularly, disregard the extra link. I will say however… being I did not post much last week, I’m planning on doing an additional strip this week (counting this one). So… extra content, sort of. Hooray? Hope everyone out there’s having a nice weekend and a good Easter… if that’s your thing. My mother’s visiting us from New York for the long weekend! 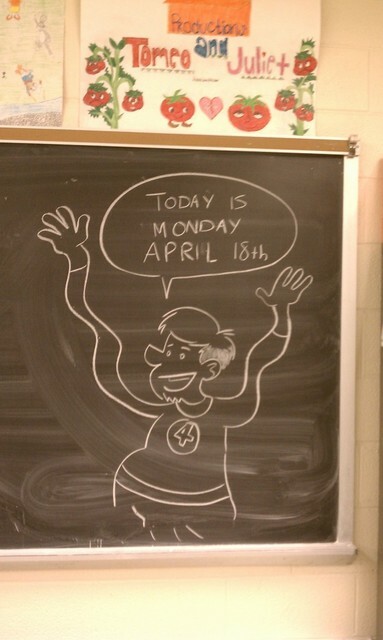 Here are this past week’s chalkboard drawings… keeping in mind, that we had a short week due to the holiday. You are currently browsing the Teachable Moments blog archives for April, 2011.